Unprecedented power outages plunged the Kashmir Valley into darkness, with authorities on Sunday blaming Saturday's heavy snowfall for the disruption. 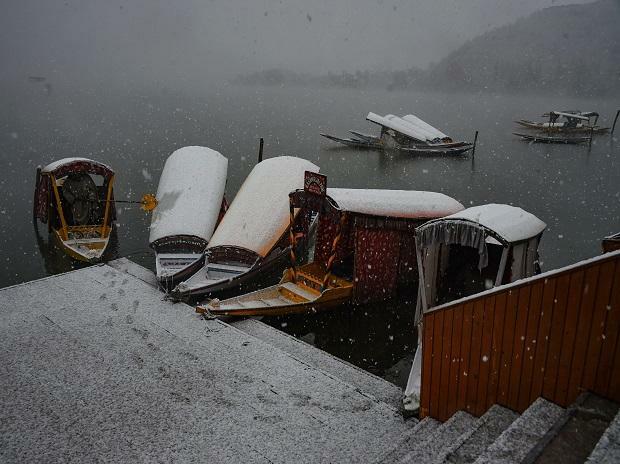 The valley witnessed snowfall in the month of November for the first time since 2009. Chief engineer electric maintenance Kashmir, Hashmat Qazi said the power outage was caused by the breakdown of major supply lines due to the fall of foliage laden branches on the supply lines. "Due to disruption of transmission lines, our supply has come down to 80 megawatts instead of the usual 1300 megawatts of routine supply," Qazi said. He added that the entire manpower of the power development department is working on restoration of the transmission lines and grid stations. Air and surface links between the Valley and the rest of the country also remained suspended. Poor visibility forced suspension of all flights from the Srinagar airport since Saturday afternoon while heavy snowfall in the Jawahar Tunnel area closed the Srinagar-Jammu highway. Snowfall has also closed the Srinagar-Leh highway and the Mughal Road that connect the valley with the Ladakh region and the Rajouri district of the Jammu division respectively. Inter-district traffic was also affected as snow accumulation on the roads caused slippery conditions. Authorities said nearly 500 people were rescued who had been caught in heavy snowfall in Peer Ki Gali on the Mughal Road and the Jawahar Tunnel area of Srinagar-Jammu highway.